Dad and I cultivated several pieces of land, totaling roughly 85 acres, in order to get ready to plant oats and red clover. Previously he'd been planting only (conventionally grown) corn and soybeans, but is willing to change his crop rotation to give me some experience growing different crops. In this case I'm starting my transition to organic production by growing oats and red clover. When the oats are harvested in July, we'll also be cutting down any weeds that have managed to grow among them, reducing the weeds that can grow in the future. This is a valuable technique for an organic grower as we can't use herbicide. The clover is planted at the same time as the oats and will barely grow until the oats are harvested. Then it takes off, and stays intact until the following spring when it's plowed under as a green manure. In the meantime it fixes nitrogen from the atmosphere, reducing the need for a lot of the nutrients normally gained by adding animal manure. Here's 2/3 of the 25 tons of pelletized composted organic chicken manure that will get spread on the acres we'll plant to oats/clover. The bucket on the loader could hold about 700 lb of pellets. It took a while to fill up the 6 ton capacity spreader (AG Systems model AG-600). Pulled the spreader behind the tractor. The pellets kept jamming in the spreader, very frustrating. It made it difficult to apply evenly. 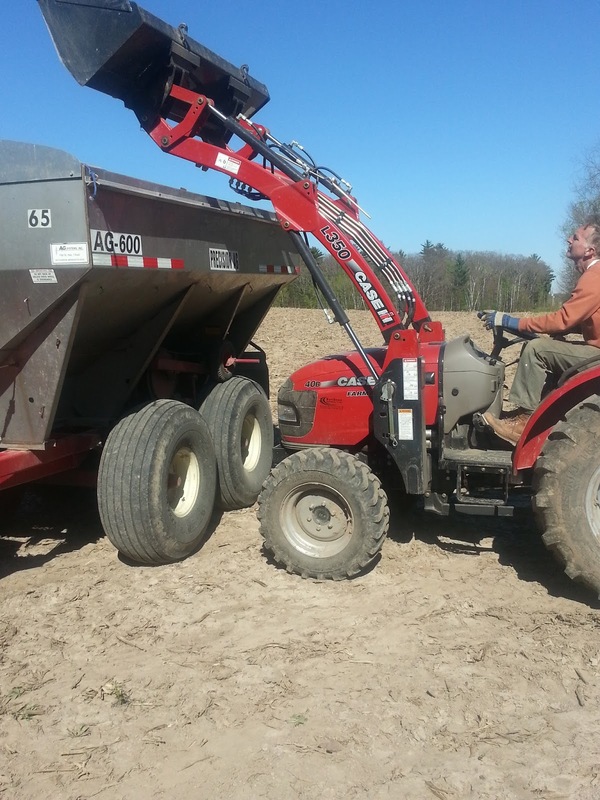 We work the manure into the soil with a field cultivator. It also leaves a relatively smooth seed bed, ready to plant into. Loading seed bags onto the trailer. 6600 lbs of seed, ready to go. Putting seeds into the planter., one 50 lb bag at a time. The planter holds about 20 bags of oats and 2 bags of clover seed. Enough to cover about 10 acres. Then we'd reload and go again. Oat seeds to the left, clover in the box to the right. The business end of the planter. Each one of the rows has it's own arm that first clears the residue, then cuts a slit for the seed, meters out the seeds then closes the soil over the slit with a trailing black wheel. I hit a rock and snapped off an arm. The 1/2" thick steel plate holding the arm to the planter broke clean in two. Some of the rocks I picked. It seemed like every other 10' wide row had this many. Made for a long day getting in and out of the tractor to get them out of the way. By the end of the row the whole cab could be full of rocks. Here's a nice big one. When I'd get to the end of the row I'd unload the rocks onto the edge of the field. Almost all planted. I do have an extra 100 lbs of clover seed (at $3.30/lb) that I need to spread. I found it hard to get the planter dialed in so that the proper amount would come out. I'll need to go back and broadcast that seed on the first parcel that is a little low. I'll say the chart showing what the machine should be set at wasn't useful at all. Not too impressed with the Great Plains drill #1006NT. We rented the no-till drill because it has a grass seed box, allowing us to plant oats and clover in one pass. The seed drill we own doesn't have the grass seed box, so I'd have to make an extra pass to broadcast the clover. I don't think I'll rent the drill again, at least not to plant oats/clover. We'll see. This is such a compelling story, Bruce. And what a gift to be working alongside your father. Looking forward to future updates. Love to you and Carl. Bet you're both sleeping well.